The diagram below illustrates metabolic pathways of carbohydrates. Although at least 14 unique GSDs are discussed in the literature, the 4 that cause clinically significant muscle weakness are Pompe disease (GSD type II, acid maltase deficiency), Cori disease (GSD type III, debranching enzyme deficiency), McArdle disease (GSD type V, myophosphorylase deficiency), and Tarui disease (GSD type VII, phosphofructokinase deficiency). One form, von Gierke disease (GSD type Ia, glucose-6-phosphatase [G-6-P] deficiency), causes clinically significant end-organ disease with significant morbidity. The remaining GSDs are not benign but are less clinically significant; therefore, the physician should consider the aforementioned GSDs when initially entertaining the diagnosis of a GSD. Interestingly, GSD type 0, which is due to defective glycogen synthase, also is recognized. These inherited enzyme defects usually present in childhood, although some, such as McArdle disease and Pompe disease, have separate adult-onset forms. In general, GSDs are inherited as autosomal-recessive conditions. Several different mutations have been reported for each disorder. Unfortunately, no specific treatment or cure exists, although diet therapy may be highly effective at reducing clinical manifestations. In some cases, liver transplantation may abolish biochemical abnormalities. Active research continues. Diagnosis depends on patient history, physical examination, muscle biopsy, electromyelography, ischemic forearm test, and creatine kinase levels. Biochemical assay for enzyme activity is the method of definitive diagnosis. G-6-P deficiency is the specific enzyme deficiency in von Gierke disease. GSD type Ib is a similar condition with the defect in the G-6-P transporter protein. A newly described form, GSD type Ic, does not appear to be related to mutations within the transporter protein. With an enzyme defect, carbohydrate metabolic pathways are blocked and excess glycogen accumulates in affected tissues. Each GSD represents a specific enzyme defect, and each enzyme is in specific, or most, body tissues. As noted above, G-6-P, which is found in the liver and kidney, is the specific enzyme that is deficient in von Gierke disease. 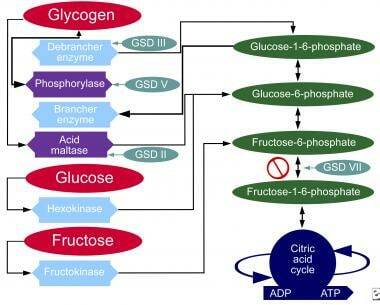 Glucose-6-phosphate is an intermediate in the glycogen pathway. Von Gierke disease is an autosomal-recessive condition. Von Gierke disease may be explained by mutations of the phosphohydrolase catalytic unit gene of the G-6-P complex, unlike GSD type Ib and GSD type Ic. Deficiency of G-6-P blocks the final steps of glycogenolysis and gluconeogenesis. This results in severe hypoglycemia. Glucose production increases with age, making hypoglycemia less of an issue. Herling and colleagues studied the incidence and frequency of inherited metabolic conditions in British Columbia. GSDs are found in 2.3 children per 100,000 births per year. GSDs are autosomal-recessive conditions, with an equal number of males and females being affected. In general, GSDs present in childhood. Later onset correlates with a less severe form. Araoka T, Takeoka H, Abe H, Kishi S, Araki M, Nishioka K, et al. Early diagnosis and treatment may prevent the development of complications in an adult patient with glycogen storage disease type Ia. Intern Med. 2010. 49(16):1787-92. [Medline]. Jones JG, Garcia P, Barosa C, et al. Hepatic anaplerotic outflow fluxes are redirected from gluconeogenesis to lactate synthesis in patients with Type 1a glycogen storage disease. Metab Eng. 2009 May. 11(3):155-62. [Medline]. Bandsma RH, Prinsen BH, van Der Velden Mde S, et al. Increased de novo lipogenesis and delayed conversion of large VLDL into intermediate density lipoprotein particles contribute to hyperlipidemia in glycogen storage disease type 1a. Pediatr Res. 2008 Jun. 63(6):702-7. [Medline]. Wang DQ, Fiske LM, Carreras CT, Weinstein DA. Natural history of hepatocellular adenoma formation in glycogen storage disease type I. J Pediatr. 2011 Sep. 159(3):442-6. [Medline]. [Full Text]. Schwahn B, Rauch F, Wendel U, Schönau E. Low bone mass in glycogen storage disease type 1 is associated with reduced muscle force and poor metabolic control. J Pediatr. 2002 Sep. 141(3):350-6. [Medline]. Melis D, Rossi A, Pivonello R, Salerno M, Balivo F, Spadarella S, et al. Glycogen storage disease type Ia (GSDIa) but not Glycogen storage disease type Ib (GSDIb) is associated to an increased risk of metabolic syndrome: possible role of microsomal glucose 6-phosphate accumulation. Orphanet J Rare Dis. 2015 Jul 29. 10:91. [Medline]. Kalkan Ucar S, Coker M, et al. A monocentric pilot study of an antioxidative defense and hsCRP in pediatric patients with glycogen storage disease type IA and III. Nutr Metab Cardiovasc Dis. 2009 Jul. 19(6):383-90. [Medline]. Kishnani PS, Boney A, Chen YT. Nutritional deficiencies in a patient with glycogen storage disease type Ib. J Inherit Metab Dis. 1999 Oct. 22(7):795-801. [Medline]. Nguyen AT, Bressenot A, Manole S, et al. Contrast-enhanced ultrasonography in patients with glycogen storage disease type Ia and adenomas. J Ultrasound Med. 2009 Apr. 28(4):497-505. [Medline]. Seydewitz HH, Matern D. Molecular genetic analysis of 40 patients with glycogen storage disease type Ia: 100% mutation detection rate and 5 novel mutations. Hum Mutat (Online). 2000 Jan. 15(1):115-6. [Medline]. Zingone A, Hiraiwa H, Pan CJ. Correction of glycogen storage disease type 1a in a mouse model by gene therapy. J Biol Chem. 2000 Jan 14. 275(2):828-32. [Medline]. Bijvoet AG, Van Hirtum H, Vermey M. Pathological features of glycogen storage disease type II highlighted in the knockout mouse model. J Pathol. 1999 Nov. 189(3):416-24. [Medline]. Matern D, Starzl TE, Arnaout W. Liver transplantation for glycogen storage disease types I, III, and IV. Eur J Pediatr. 1999 Dec. 158 Suppl 2:S43-8. [Medline]. Amato AA. Acid maltase deficiency and related myopathies. Neurol Clin. 2000 Feb. 18(1):151-65. [Medline]. Applegarth DA, Toone JR, Lowry RB. Incidence of inborn errors of metabolism in British Columbia, 1969-1996. Pediatrics. 2000 Jan. 105(1):e10. [Medline]. Chen Y. Glycogen Storage Diseases. Scriver CR, Beaudet AL, Sly WS, Valle D, eds. The Metabolic and Molecular Basis of Inherited Disease. 8th ed. New York, NY: McGraw-Hill; 2001. 1521-51. Fernandes J, Smit G. The Glycogen Storage Diseases. Fernandes J, Saudubray JM, Van Den Berghe G, eds. Inborn Metabolic Diseases: Diagnosis and Treatment. 3rd ed. New York, NY: Springer-Verlag; 2000. 87-101. Geberhiwot T, Alger S, McKiernan P, Packard C, Caslake M, Elias E. Serum lipid and lipoprotein profile of patients with glycogen storage disease types I, III and IX. J Inherit Metab Dis. 2007 Jun. 30(3):406. [Medline]. Goldberg T, Slonim AE. Nutrition therapy for hepatic glycogen storage diseases. J Am Diet Assoc. 1993 Dec. 93(12):1423-30. [Medline]. Hou DC, Kure S, Suzuki Y. Glycogen storage disease type Ib: structural and mutational analysis of the microsomal glucose-6-phosphate transporter gene. Am J Med Genet. 1999 Sep 17. 86(3):253-7. [Medline]. Lin B, Hiraiwa H, Pan CJ. Type-1c glycogen storage disease is not caused by mutations in the glucose-6-phosphate transporter gene. Hum Genet. 1999 Nov. 105(5):515-7. [Medline]. Moses SW. Historical highlights and unsolved problems in glycogen storage disease type 1. Eur J Pediatr. 2002 Oct. 161 Suppl 1:S2-9. [Medline]. Orho M, Bosshard NU, Buist NR. Mutations in the liver glycogen synthase gene in children with hypoglycemia due to glycogen storage disease type 0. J Clin Invest. 1998 Aug 1. 102(3):507-15. [Medline]. Pears JS, Jung RT, Hopwood D. Glycogen storage disease diagnosed in adults. Q J Med. 1992 Mar. 82(299):207-22. [Medline]. Reitsma-Bierens WC. Renal complications in glycogen storage disease type I. Eur J Pediatr. 1993. 152 Suppl 1:S60-2. [Medline]. Salapata Y, Laskaris G, Drogari E. Oral manifestations in glycogen storage disease type 1b. J Oral Pathol Med. 1995 Mar. 24(3):136-9. [Medline]. Smit GP, Fernandes J, Leonard JV. The long-term outcome of patients with glycogen storage diseases. J Inherit Metab Dis. 1990. 13(4):411-8. [Medline]. Stevens AN, Iles RA, Morris PG. Detection of glycogen in a glycogen storage disease by 13C nuclear magnetic resonance. FEBS Lett. 1982 Dec 27. 150(2):489-93. [Medline]. Veiga-da-Cunha M, Gerin I, Chen YT. The putative glucose 6-phosphate translocase gene is mutated in essentially all cases of glycogen storage disease type I non-a. Eur J Hum Genet. 1999 Sep. 7(6):717-23. [Medline]. Wolfsdorf JI, Holm IA, Weinstein DA. Glycogen storage diseases. Phenotypic, genetic, and biochemical characteristics, and therapy. Endocrinol Metab Clin North Am. 1999 Dec. 28(4):801-23. [Medline]. Yang Chou J, Mansfield BC. Molecular Genetics of Type 1 Glycogen Storage Diseases. Trends Endocrinol Metab. 1999 Apr. 10(3):104-113. [Medline].